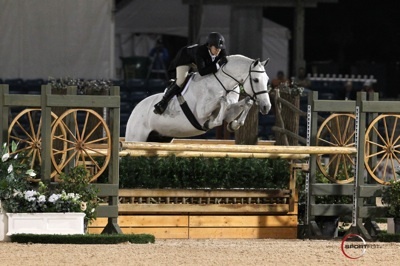 Louise Serio and Castle Rock won the WCHR Palm Beach Hunter Classic Spectacular at the 2011 FTI Winter Equestrian Festival. Photo © Sportfot, Official Sport Photographer of the FTI Winter Equestrian Festival, www.sportfot.com. 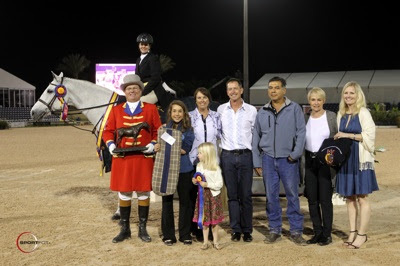 Wellington, FL - February 18, 2011 - Louise Serio and Castle Rock earned a victory in the WCHR Palm Beach Hunter Classic Spectacular on Friday evening at the FTI Winter Equestrian Festival following two beautiful rounds of competition. After two weeks of qualifying competition, only the top horses and riders had the opportunity to compete in a fantastic class held under the bright lights of the impressive International Arena at the Palm Beach International Equestrian Center. Ken Krome of Maryland designed the course for this evening's class. A total of 25 entries began the competition in round one and the top eight were then invited to return for a second round course. Finishing in first place, Louise Serio of Kennett Square, PA, rode Bryan Baldwin's Castle Rock to the win with her two round total of 177.62. The pair finished round one in third place with a score of 87.12, and then earned the class high score of 90.50 in round two to move to the top of the field. Scott Stewart and Krista Weisman's Reality held on to their second place position in both rounds one and two, earning an 88.50 and an 88.37 for a total score of 176.87. Defending champions Liza Boyd and Brunello, owned by Boyd and Janet Peterson, finished first in round one with an 89.50 and then slipped into third place in the overall standings with an 85.75 in round two for a total of 175.25. Boyd also earned the fourth place honors riding Sarah Ward's Onassis to a two round total of 175.12. Patricia Griffith and Sienna, owned by Lexi Maounis, earned fifth place overall with their score of 173.56. The sixth, seventh and eighth place competitors remained consistent with their places through both rounds one and two. Tim Goguen rode Whatever, owned by Boggs Hill, to a total of 170 to earn sixth place. Lyman Whitehead guided Visse Wedell's horse Spandau to a score of 156 to earn seventh place, and Maggie Jayne and Pony Lane Farm's Early Applause rounded out the top eight with their score of 152.90. Class winner Louise Serio was thrilled with her rounds in tonight's competition and spoke about the class. "I loved my second round even better than my first," she smiled. "I thought the course was fantastic and it rode beautifully. I thought my horse was fantastic. He is pretty much a veteran at this now, so it is nice to have a horse that is so made and that has been successful before in these classes." 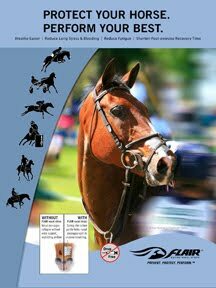 Serio and Castle Rock won the $50,000 USHJA International Hunter Derby at the 2010 FTI Winter Equestrian Festival last season among many other accomplishments throughout their careers. Castle Rock is a 12-year-old KWPN Dutch Warmblood gelding by Corland. "He will have some time off now because that is what he does," Serio laughed. "He just shows a little bit and then has some time off because he is so made." She added, "I think it was a great night. The whole class for me was great. The length of the course, the way you got to get in the ring when you were waiting for scores, everything just went really nicely tonight." Second place finisher Scott Stewart was very happy with his mount Reality tonight as this was the eight-year-old Mecklenberg stallion's first night class. "I was thrilled with him because I did not know what he would do and he was perfect really," Stewart smiled. "I could not have expected him to be as good as he was; I was really happy." Although they finished in third place tonight, Liza Boyd was pleased with Brunello's performance and noted that he, like Castle Rock, is also a seasoned veteran and only comes out for the big classes. Brunello is a 13-year-old Hanoverian gelding. "He really made a great effort in the first round," Boyd noted. 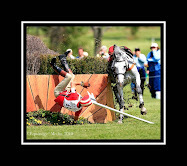 "He tried really hard and then in the second round I just made a little mistake to the first jump; I was a little slow. He knows his job and he is just great." In addition to this evening's class, several special awards were presented for the conclusion of professional competition during WCHR week. Scott Stewart earned the award for Professional High Score during the week's competition for his ride aboard Empire. Jennifer Bliss was then presented with the Champion Equine Insurance Trophy for the Emerging Professional High Score for her ride aboard Elitere during the week. Early Applause earned the Charlie Weaver Memorial Award as the top conformation horse. The competitors also received special prizes from Tailored Sportsman for their efforts throughout the WCHR competition. Concluding WCHR competition, the Amateur-Owner 3'3" Classic will be held on Saturday afternoon, followed by the WCHR Junior/Amateur-Owner Hunter Classic Spectacular and the Peggy Cone Adult Hunter Classic on Sunday. About the WCHR: In 1995, the inaugural World Championship Hunter Rider Pro Finals were held as the culmination of an awards program of the American Hunter Jumper Foundation to recognize and celebrate the hunter rider. WCHR program participants qualify at member competitions held throughout the year to compete in these finals. In 1997, the WCHR Spectacular was added to the qualifying menu and quickly became one of the premier events which exemplifies the high standards set for the WCHR program. In 2010 the American Hunter Jumper Foundation transferred its assets and programs to the USHJA in an effort to further their vision for our sport. The USHJA is excited to showcase the WCHR program to its members as it continues to grow in popularity.